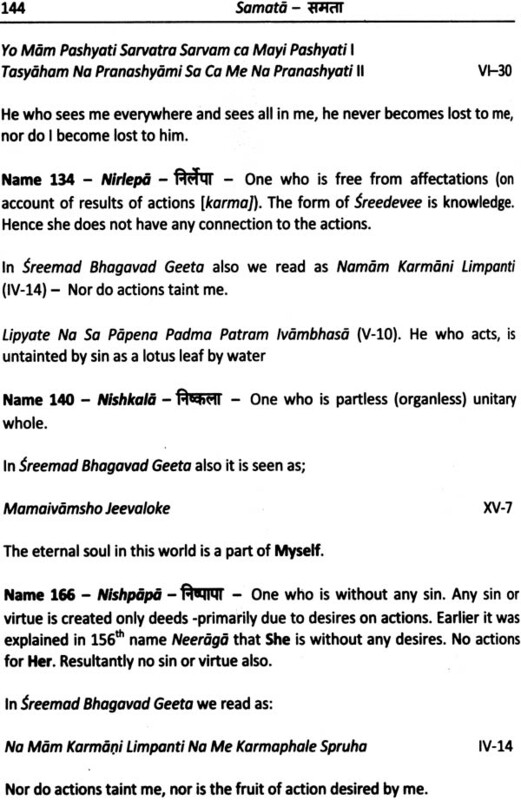 There are lot of Puranas and Stotras about every God/ Goddess in Hindu religion. This provides liberty to the devotees to imagine the God/ Goddess in the form of His/her choice. However, when these Puranas and Stotras are studied in depth it is very clear that they all convey the same sense.In one place it is Narayana and in another place it is Narayani. Somewhere it is as Ardhanarishvara- ie. He left half of Sankara is Sridevi and in another place he is Sankaranarayanan- i.e. Narayana sharing the vody-left half with Lord /sankara. 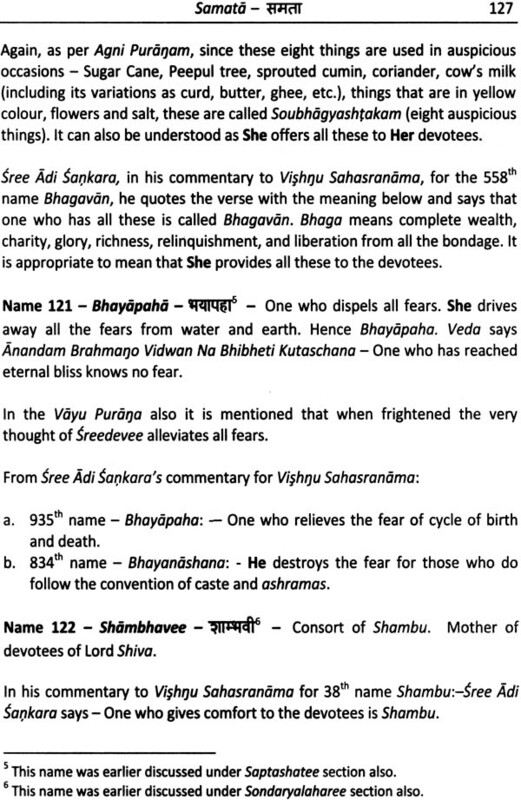 Logically this clearly implies that both Shreedevee and Narayana are one and the same. 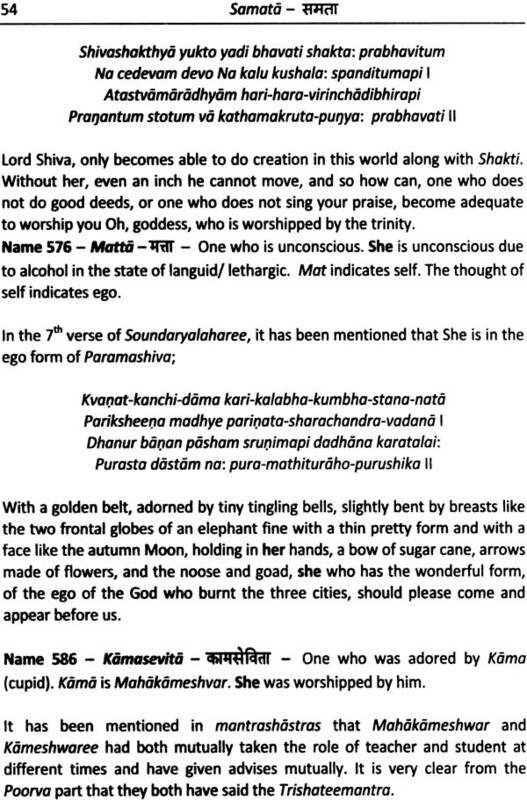 Likewise there are lots of similarities between Stotras about different Gods/ Goddesses. It may not be a surprise that Lalita Sahsranama has similarities with Soundaryalahari and Saptashati, because all the three are about Sridevi. But how about Visnu Sahasranama and Srimad Bhagavad Gita. Primarily they are supposed to talk about Lord Visnu, but still they also talk the same language- about Sridevi. Hence it can be concluded that there is only one God. Whichever form of God we worship we are in the path to libration. Devotees can imagine the form of that God in the way they like and worship. Let Sridevi shower her choicest blessing on the readers. "There is only one truth, the wise men call it in many ways"- says the Vedas. There are many paths to achieve the supreme truth. Jnana Yoga, Bhakthi Yoga, Raja Yoga and Karma Yoga are the four main paths. In this beautiful work of Sri Ramamurthy, he has synthesised these paths in a befitting manner. Understanding (Jnana) is the function of the intellect, Bhakti is the function of the mind. Bhavana is the function of the heart, which is a synergy between Intellect and Mind and is that which liberates. Shakta and Vaishnava are two major sects of Hinduism, each one provides the means to reach the one supreme truth. However there has been some confusion and conflict due to ignorance of their fundamentally common goal. 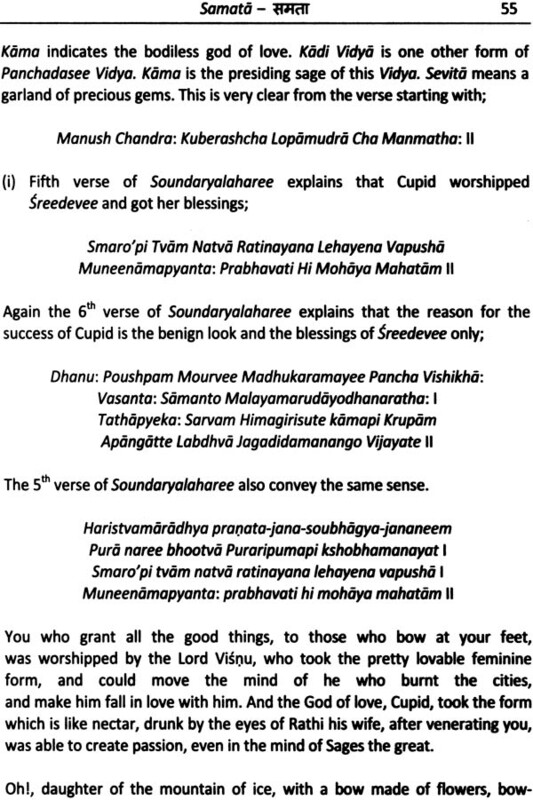 Here, Sri Ramamurthy has vividly brought to light, the deeper meaning and purport of the major texts of these two sects namely Soundharayalaharee, Devi Mahatmeeyam and Lalita Sahasranamam on one side and Vishnu Sahasranamam and Bhagvat Geeta on the other side in order to establish the underlying oneness and resolve all conflicts. He has established that Jnana Yoga and Bhakti Yoga complement each other. Sri Ramamurthy's language skills, his diligent pursuit of deeper meaning of the words and ability to intelligently connect them across the texts is highly commendable and will prove to be a valuable boon to both Bhaktas and seekers of knowledge. I am sure, that this Book shall help sincere Sadhakas to understand the deeper aspects of the two sects and appreciate the underlying oneness in their spiritual goal. It will also help resolve in an informed manner the conflicts that may arise. "Knowledge gives depth to devotion. Devotion gives beauty and fragrance to knowledge. Knowledge without devotion is intellectual gymnastics and purposeless verbal warfare, while devotion without knowledge is mere superstition and a fairy tale", says the Shastras. May the supreme truth bless the author and the readers with the experience of true oneness with the self. 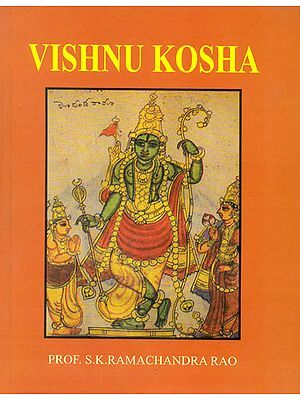 We learn more about the two gods/ goddesses - Visou and Sakti - through Visnu Parana and Devee Mahatmya. The chanting of the Namas or the Divine names has an important place in the disciplines advocated by the Bhakti tradition of Hindus. 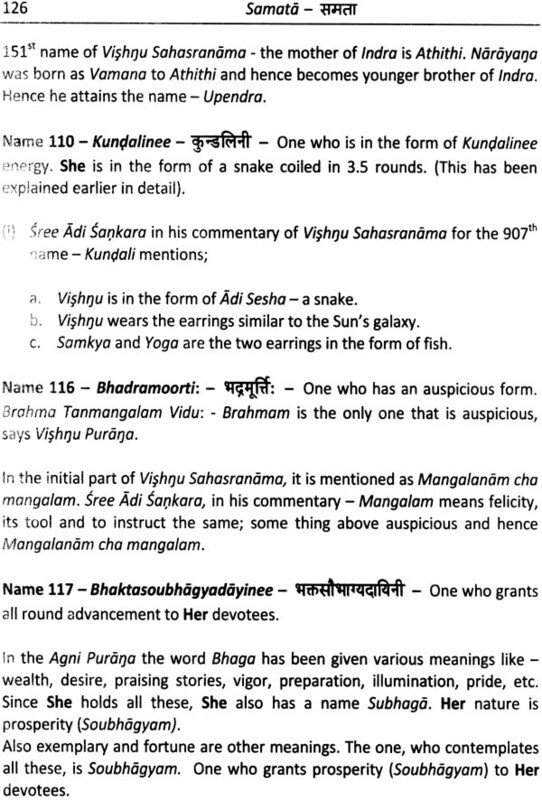 This is being done in various ways viz., Satam (100), Trisatam (300), and Sahasram (1000). 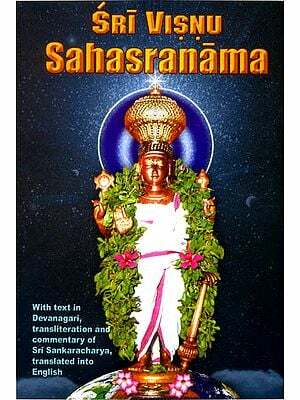 The Sahasranama is perhaps the most popular and the holiest form of chanting of names among the devotees. The word Sahasranama means "thousand names". The world knows about so many Sahasranamas about almost each one of the Hindu Deities. Two of them have attained great popularity and form part of the devotional programmes of the worship of the deities to whom they are related. These two are the most popular and widely chanted - Lalita Sahasranama and Visou Sahasranama. Who is this holy lady who was mentioned by you as the Great enchantress? Where from was she born? What are her duties? Hey! What are the powers of that holy lady, how does she look like and wherefrom was she born? Be pleased to tell me all these. 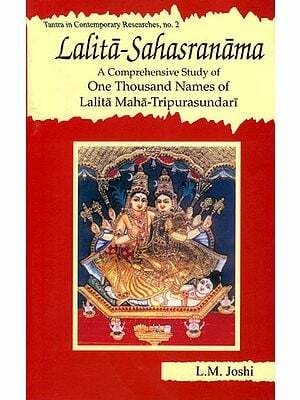 Though these questions have been replied in Saptashatee itself, all these questions are answered in sequel inter alia in Lalita Sahasranamo, as if describing her. 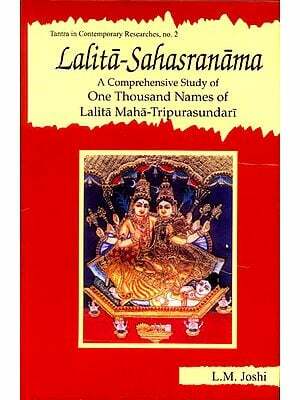 For instance let us ask some questions and seek answer in Lalita Sahasranamo itself. Who is she? - Sreemata - She is the supreme mother. What does she do? - Sreemaharajnee - She is the protector of the whole world. Where is she sitting? - ireematsimhasaneshwaree - She is seated grand throne. Wherefrom She was born? - Chidagnikurjg'asambhoota - She emerged from the sacrificial fire of knowledge. What for? - Devakaryasamudyata - to serve Devas. • Udyadbhanusahasrdbha - Her lustre is equal to thousands of rising Suns. The word Sahasram also means infinite. • Chaturbahusamanvita - One with four hands. 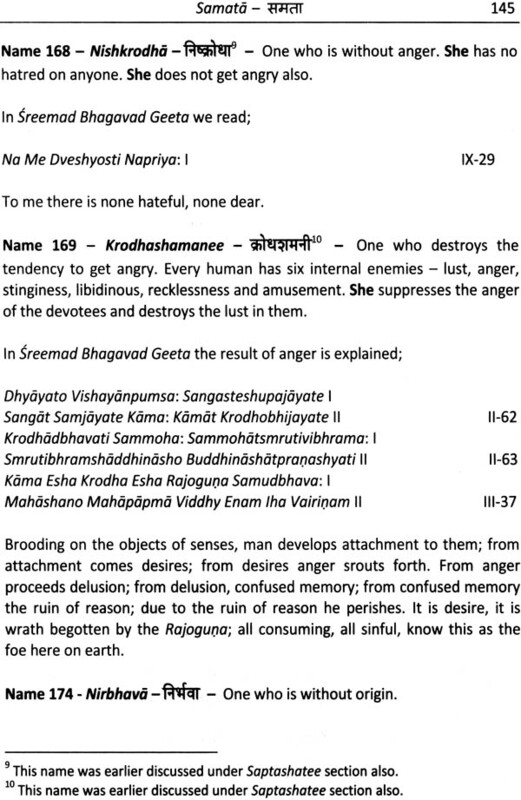 • Ragasvaroopapashadhya - One who carries the weapon of desire in the form of a noose. • Krodhakarangkushojvala - Her lustre is enhanced by holding the goad symbolising anger. Manoroopekshukodana'a - She dons a bow made of sugarcane - the physical form of 'mind'. Panchatanmatrasayaka - She has five attributes as arrows. • Champakashokapunnagasougandhikalasatkacha - She has beautiful hair studded with Magnolia, Asoka, Rhizophora mucronata (Punnaga) and Red Lotus flowers. • Kuruvindamaqishreerjeekanatkoteeramandita - Kuruvindamaqi is the precious stone Ruby. Sreedevee's crown is studded with a string of Rubies. • Ashtameechandra Vibhrajadalikasthala Shobhita - One whose forehead shines like the Moon on the eighth day of lunar half month. • Mukhachandrakalangkabhamruganabhiviseshaka - The bindi (musk dot) on the forehead of Shreedevee resembles the black spot on the surface of the Moon and it further beautifies the face. Vadanasmaramangalya-gruhatorarjachillika - One whose eyebrows look like festoons in front of Cupid's house which is Sreedevee's face. • Vaktralakshmee Pareevahachalanmeenabhalochana - One whose eyes look like fish swimming in the stream of beauty of Sreedevee's face. Where does she live? - Jwalamalinikakshiptavahniprakaramadhyaga - She dwells in the centre of the fort of fire built by Jwalamalini. • Sumerumadhyasrungastha - One who dwells in the central peak of mount Meru. • Sreemannagaranayika - The head of [nayika) Sreenagaram. • Chintamarjigruhantastha - One who dwells in a house constructed of Chintamaiji. • Panchabrahmasanasthita - One who sits on a seat made of five Brahmams. In this fashion this can continue. 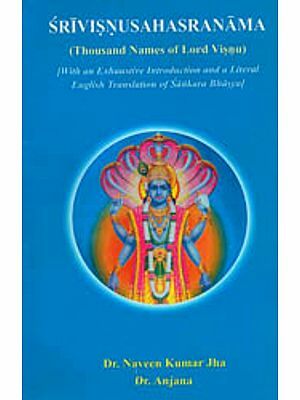 Lalita Sahasranama into English, which was completely based on Bhaskararaya's bhashyam. 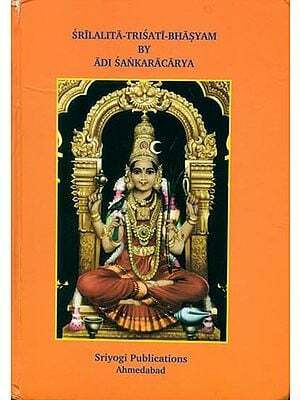 In this book, every name is compared with the corresponding meanings/ analogies in 20+ Upanishads, various mantras,' Brahma Sutram, Devee Bhagavatam, Maha Shoa'anyasam, Nitya Shoa'ashikarnavam, different Sutras, Shiva and other Puranas, Soundaryalaharee, Shree Lalita Trishatee, Shree Lalitopakyanam, Shree Varivasya Rahasyam, Shreemad Bhagavad Geeta, Shree Vidyasaparyapaddhati, Srutis, Smrutis, Visnu Sahasranama and what not? 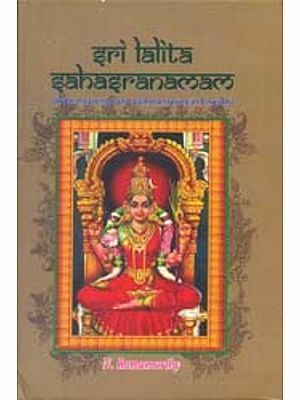 This has induced me in venturing into this comparative study of Lalita Sahasranama with Soundaryalaharee, Saptashatee, Visnu Sahasranama and Shree Bhagavad Geeta. It is not a surprise that we have some commonalities between Lalita Sahasranama with Soundaryalaharee and Saptashatee, since all the three are on Shree Devee. But the other two Visnu Sahasranama and Shree Bhagavad Geeta are about/ on different God(s). But still we have lot of similarities in names, functions, characteristics, etc. Ultimately this boils down to our simple goal that all the gods are one and the same. They play different roles/ characters on different occasions and depending on the wish and whims of the devotees. 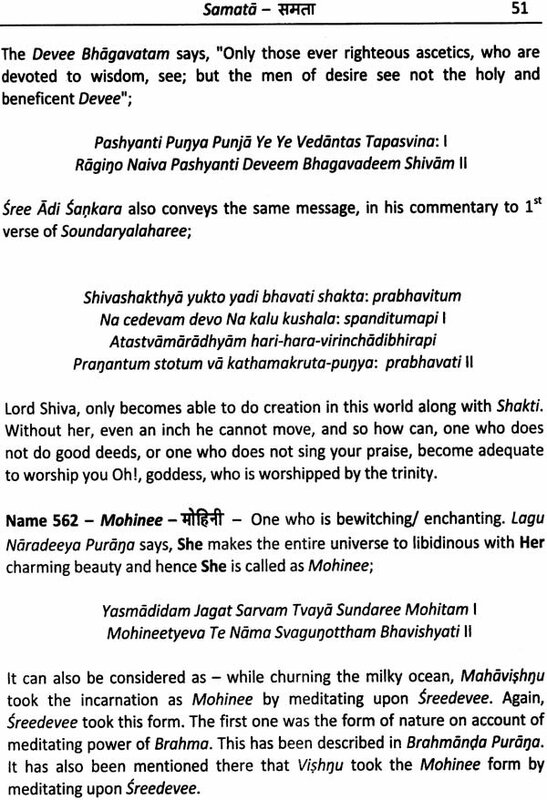 Conventions used in this book: Wherever she is used to indicate Shreedevee it has been written in bold as She. 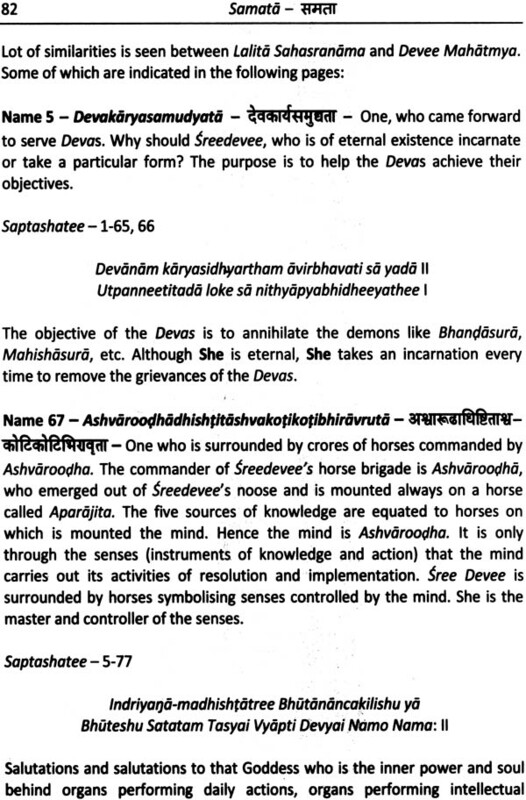 The transliterated Samskrit words are written in italics - for instance Devee. 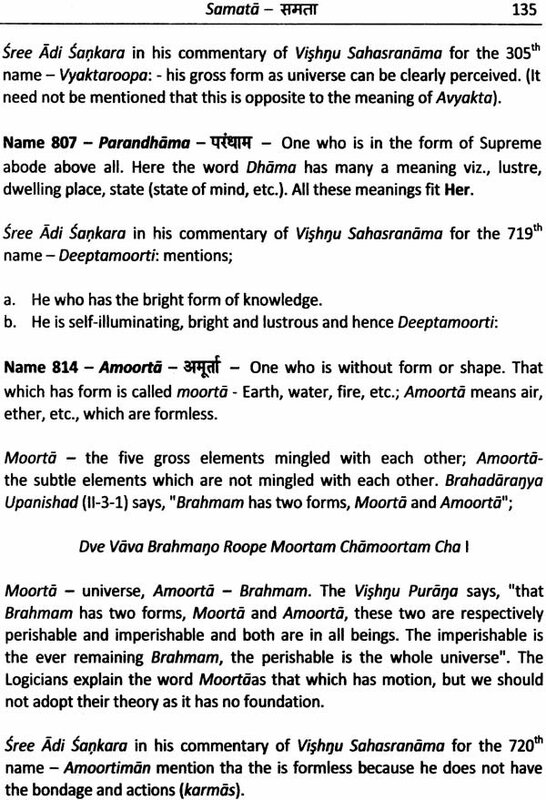 When Samskrit words are transliterated in English diacritical marks are normally used. However the same has not been used in its entirety in this book, since it makes the reading a little more difficult and since this book is intended for common audience. Many many thanks from the bottom of my heart are due to Br Samid Chaitanya of Chinmaya Mission, Mumbai, who has written a nice introduction and some pleasantries about this edition. My sincere thanks are due to Shree. T. S. Narayanaswamy, and Shree Perumal who immediately came out of the theme and nicely designed the wrapper. I will be failing in my duty if I do not thank Shree. M. Easwaran, who has published this book. He not only does the publication tasks, but also reviews the book and gives vital feedback so that the book is in the fashion it is at present - even amdist all constraints like soaring power cut, etc. Nice job done - thanks a lot. Sincere thanks are due to all those who supported in this noble cause. Let the readers be blessed with the glory of Sridevi. The readers are requested to give all comments and feedback to the author.